If the deviations are small surface is smooth, if they are large, the surface is rough. 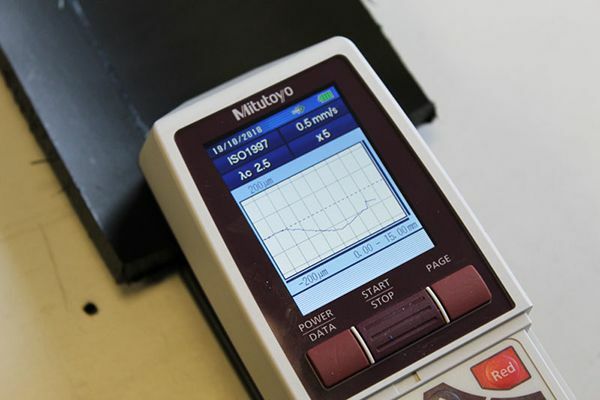 Impact use the state of the art Mitutoyo Surftest SJ-210 Portable Surface Roughness Tester. This tester is portable, hence making it possible to perform measurements on site and on parts with difficult to access areas. The tester uses a stylus type probe of radius 5µm. It comes with a calibrant to calibrate and perform equipment checks. The Surftest SJ-210 complies with the following standards: JIS (JIS-B0601-2001, JIS-B0601-1994, JIS B0601-1982), VDA, ISO-1997, and ANSI. Ra – arithmetical mean roughness value. Rmr(c) – material component of the profile. RSm – mean peak width.